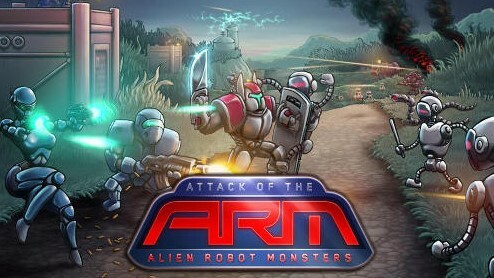 Steam Store Description (from Ad Blurbs)Alien Robot Monsters is an epic sci-fi tower defense action game with a 16-bit era look and feel. Somewhere in the future, humanity's desire to expand to the stars is yet again faced with expected adversity. After finding an earth-like planet capable of sustaining a civilization, a colony ship is sent with a small detachment of space marines. However, the whole planet seems to be infested with hostile robotic life forms bent on removing all humans from the planet. The fate of humanity is in your hands! New unlocks in almost every level will keep you hungry for more!